Good afternoon. It is a pleasure to join you today for the launch of the Diversity List 2019: Youth to Watch. As some of you may know, I took part in the inaugural Diversity List launch three years ago, that is 2016. At the time, I was the Chief Secretary for Administration. 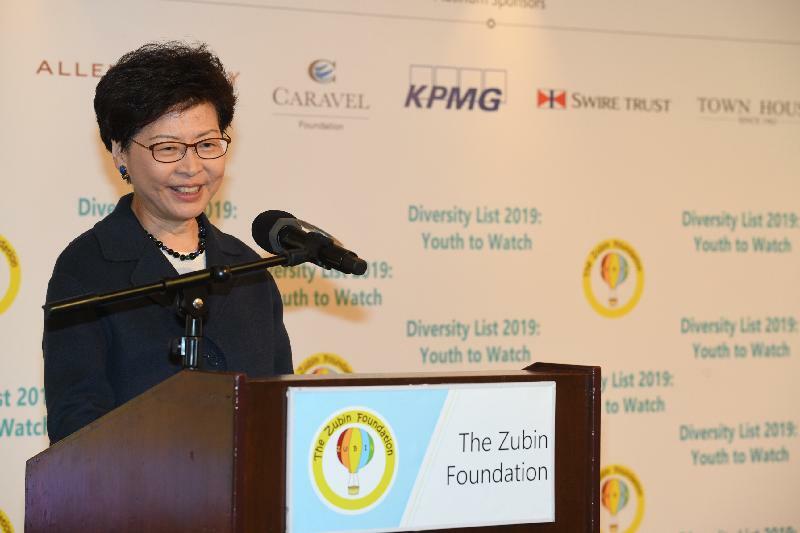 I'm delighted to return today as the Chief Executive of the Hong Kong Special Administrative Region, here to applaud The Zubin Foundation and its vision of improving the lives of our ethnic minorities. It's a vision I share, a vision my Government shares. Through this Diversity List initiative, the Foundation is committed to expanding representation among Hong Kong's ethnic minorities in our advisory committees; to getting their voices and their ideas heard; and to ensuring that our ethnic minorities play a significant role in Hong Kong’s future. The reason is simple – the ethnic minorities are part of the Hong Kong family, so Hong Kong's future is their future. Each year since 2016, the annual Diversity List has identified a number of talented, non-Chinese individuals. With the professional support of Spencer Stuart, this identification process is a serious and thorough one. As a result, the identified candidates are very well informed about Hong Kong's issues and are passionate about improving people's well being, ready to make a difference for Hong Kong. What's more, they are committed to serving the people through participation in government advisory and statutory bodies. These several hundreds of advisory and statutory bodies play an important role in Government, assisting us in consultation with stakeholders and in the formulation of policy objectives, and where some of these bodies are actually tasked with executive functions, they are important bodies in implementing important government policies. Through these bodies, community leaders are identified and nurtured, and some of these community leaders subsequently could be appointed to become politically appointed officials of the Hong Kong SAR Government. I'm pleased to note that 18 individuals from the Diversity Lists of the past three years now serve on 27 Government boards and committees, but of course we have other sources to identify ethnic minority talents for appointment. This year's Diversity List particularly targets young people from 18 to 35. That, I'm very pleased to note, echoes my Government's efforts to encourage more young people to participate in policy discussion and debate. That also reflects the reality that our ethnic minority population, particularly the youth, is surging. Between 2006 and 2016, for example, the population of South Asian residents between 15 and 34 increased some 53 per cent to 71 000. Ethnic minority youths receive local education and are immersed in the local culture. Many speak fluent Cantonese and mix well with Chinese friends. They are familiar with issues locally and globally. No less important, they have grown up in the digital age, accustomed to expressing their opinions on social media. We are eager to bring their voices, their insight, their ideas and their commitment into Government. The Government's twice-yearly Member Self-recommendation Scheme for Youth encourages participation in policy discussion. It invites those between 18 and 35 to nominate themselves to become members of government advisory committees. The Scheme's second phase was set in motion last December. 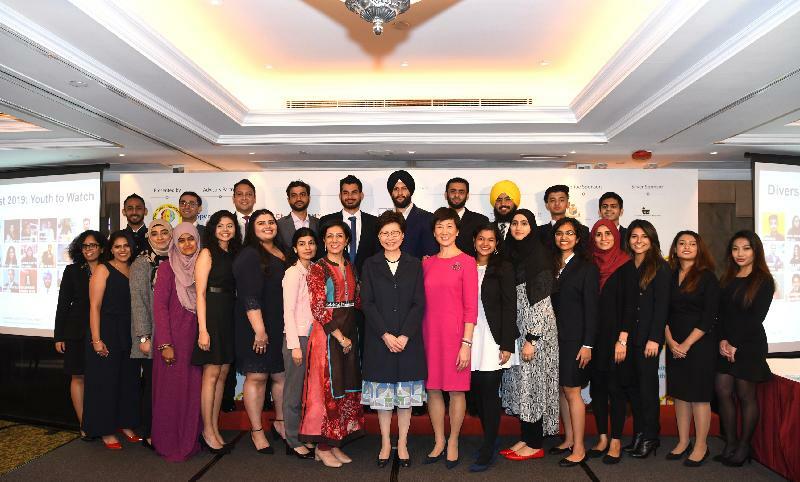 I'm pleased to say that more than 1 400 young people, including ethnic minority youths, applied to serve on 10 government advisory boards and committees. My Government's target is more ambitious still. We are committed to expanding the ratio of young members in our advisory boards and committees to 15 per cent by the end of this current-term Government. For those of you who are interested in serving, you are most welcome to join the Self-recommendation Scheme in future, or you can just forward a curriculum vitae form to our Home Affairs Bureau. It will add your name to a database from which bureaux and departments draw suitable candidates for their advisory boards and committees. We are, let me add, fully committed to promoting equal opportunities for ethnic minorities and eliminating racial discrimination in Hong Kong. This requires concerted efforts by different government bureaux and departments. That's why we established the Steering Committee on Ethnic Minority Affairs last July under the chairmanship of the Chief Secretary. We are also working to improve the Administrative Guidelines on Promotion of Racial Equality for all government bureaux and departments, as well as organisations that provide services to ethnic minorities. To enhance legal protection for ethnic minorities, we have introduced a bill that would take forward eight recommendations from the Equal Opportunities Commission on the Discrimination Law Review submission. Six of those recommendations are related to the Race Discrimination Ordinance. Legislation, of course, is not enough. Public education and better integration of our ethnic minorities are equally essential. In that regard, the Equal Opportunities Commission produces a wide variety of publicity and educational offerings. These include weekly radio programmes, newspaper and MTR advertisements, as well as roving exhibitions and school events. Ladies and gentlemen, building a harmonious and inclusive society demands surpassing commitment and exceptional dedication. The very tragic incident that happened yesterday, taking away so many lives, again reminds us of the importance of inclusion. The Zubin Foundation and Spencer Stuart have that in abundance, and Hong Kong has become a better place with their continuing efforts in engaging our ethnic minority communities, and in working hand-in-hand with my Government to create an inclusive and flourishing Hong Kong. Thank you very much, Shalini, Ravi and Alice. Finally, my congratulations to the young men and women selected for this year's Diversity List. I wish each of them, and all of you, healthy, harmonious and rewarding year ahead. I look forward to seeing some of these young men and women in my Government committees soon. Thank you very much.